To see the original "Crescent of Embrace" and "Bowl of Embrace" design graphics, go to the "supplementary material" page. Left: publicity shot of winning Crescent of Embrace design, from Paul Murdoch Architects, 2005 (from the Pittsburgh Post Gazette, September 8, 2005). Right: Wikipedia’s “typical” Islamic crescent and star, colored red and viewed from a similar orientation. 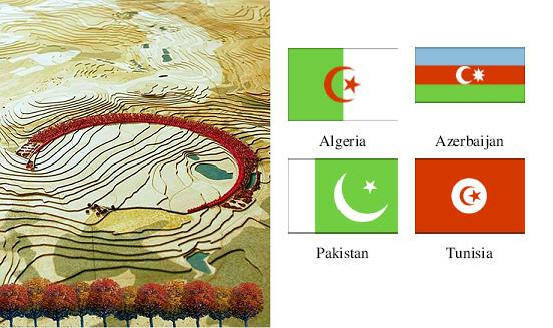 The copse of trees that sits roughly in the position of the star on an Islamic flag marks the crash site. 2. 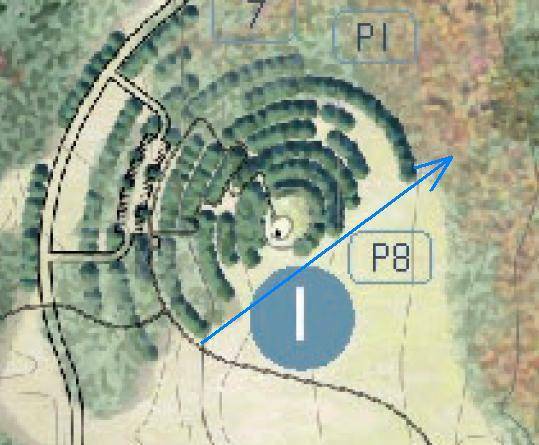 The giant crescent points almost exactly to Mecca, and architect Paul Murdoch proves that this orientation is intentional by repeating it exactly in the crescents of trees that surround the Tower of Voices part of the memorial. Instructions here. Animation superimposes the Bowl of Embrace redesign on the original Crescent of Embrace design, then takes away everything but the changes (the flashing extra arc of trees). Now instead of the broken off part of the circle being removed entirely, a chunk of the broken off part of the circle remains floating out behind the mouth of the crescent, which remains completely unchanged. The unbroken part of the circle, what symbolically remains standing in the wake of 9/11, is still a giant Islamic-shaped crescent, still pointing to Mecca. 5. The 9/11 date will be inscribed on a separate section of Memorial Wall, set in the exact position of the star on an Islamic crescent and star flag. 6. There are only 38 Memorial Groves instead of the advertised 40, forming a set of 19 nested crescents: one for each 9/11 terrorist. 7. The Tower of Voices is a year round accurate Islamic sundial. 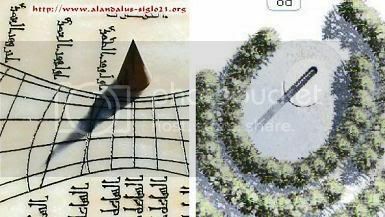 Traditional Islamic sundial, left. The gnomon's shadow is just reaching the outer curved vertical, indicating time for Islamic afternoon prayers. Tower of Voices, right. Shadow calculations confirm that, when the tower's shadow reaches the inner arc of trees, it will also be time for Islamic afternoon prayers. Features 1, 2, 3, 4 and 7 above were singled out for mention in our petition to stop the crescent design. Short explanations with graphical demonstrations were included on the back of our paper petition, and by link from our electronic petition. Six short exhibits provide proof that the half-mile wide central crescent of the Crescent/Bowl of Embrace design is oriented on Mecca, and that this orientation is not a coincidence and that it remains intact in the Bowl of Embrace redesign. The book provides multiply redundant proof of these and many other terrorist-memorializing features. Exhibit 1. Crescent and star. Exhibit 2. Not just a crescent, but an Islamic crescent. Murdoch’s crescent has the same circular-inner-arc geometry of an Islamic crescent, it covers the same 2/3rds of a circle of arc as a typical Islamic crescent, and it has the red color that is most associated with the Islamic crescent. In contrast, the inner arc of a lunar crescent is elliptical (it is the circular dividing line between the lit and dark halves of the moon, viewed from an oblique angle), and it only covers a half a circle of arc. Mr. Murdoch claims to be familiar with the Islamic crescent, and the similarity of his crescent to the Islamic crescent would suggests that he is familiar with the Islamic crescent, which would seem to make his statement to the press about his crescent having a different geometry than the Islamic crescent a case of plain deception. Exhibit 3. It points towards Mecca. Shortly after the unveiling of the Crescent of Embrace, the anonymous “Etaoin Shrdlu” posted a graphic demonstrating that a person facing directly into the Crescent of Embrace would be facing almost exactly at Mecca, the direction that Muslims face for prayer. Over the next couple of weeks, several bloggers verified this result, both mathematically and graphically. The simplest demonstration of Mecca orientation was put together by Sarah Wells at the bluemerle blog who found an Islamic website (Islam.com) that will generate a graphic of the direction to Mecca (the “qibla” direction) for any city in America. 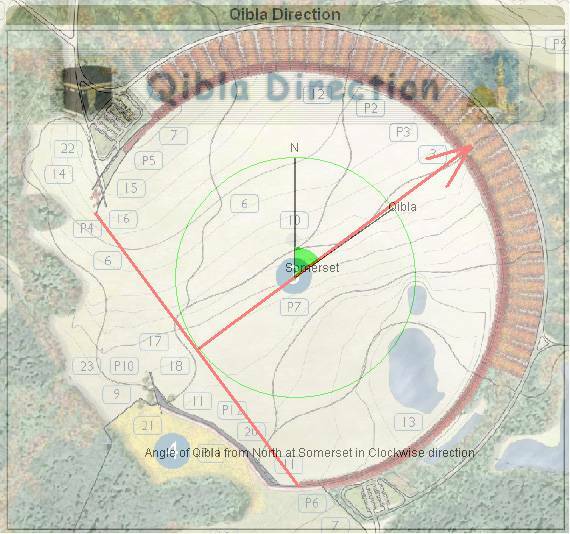 Superimposing the qibla graphic for Pittsburgh on the Crescent site-plan, Sara was able to demonstrate, not just that the Crescent of Embrace is oriented on Mecca, but that this is indeed the direction that Muslims face for prayer. 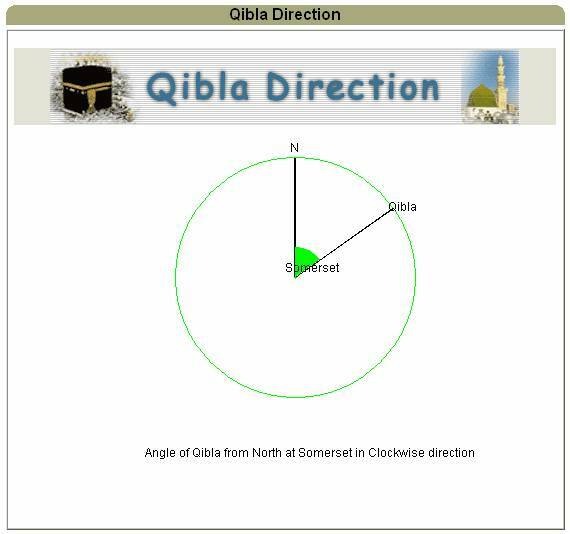 The qibla direction from Somerset PA, generated by Islam.com. Overlay shows that the Crescent of Embrace is oriented just slightly north of the exact direction to Mecca. The exact direction to Mecca from the crash-site (about ten miles east of Somerset) is 55.19° clockwise from north. Thus the Crescent of Embrace is oriented about 1.8° north of the exact Mecca line. Instructions for doing exact calculations are included at the end of this post, but with the overlay method, these calculations are not necessary. One can see directly how closely the two orientations correspond. If the Mecca-orientation of the giant Crescent of Embrace were coincidental, it would still be inappropriate. We cannot use a symbol of Islam, oriented towards the spiritual center of Islam, as the central feature of the Flight 93 memorial, even unintentionally. But is it unintentional? 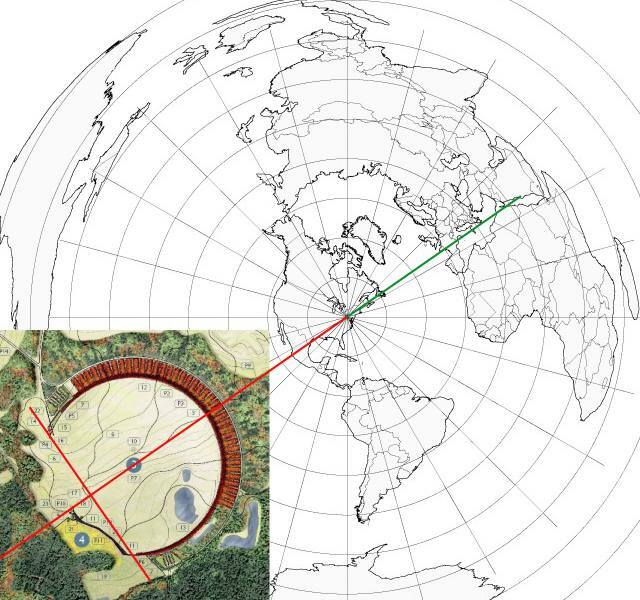 Paul Murdoch’s Crescent design includes numerous confirmations that the Mecca-orientation of the giant crescent is not a coincidence. Consider one. In addition to its gigantic central crescent, the Crescent design also includes a gigantic Tower of Voices: a ninety-three foot tall tower, formed in the shape of an extruded crescent, surrounded by a vast array of crescents of trees. A line drawn across the most obtruding tips of the Tower crescents has the exact same slightly-north-of-Mecca orientation of the central crescent. That is, the Tower-crescents are turned exactly 90° to the giant central crescent (where it is the perpendicular to the crescent-tip line that points slightly north of Mecca). Red and blue make purple. The orientations are identical, within the pixel resolution of the graphics. 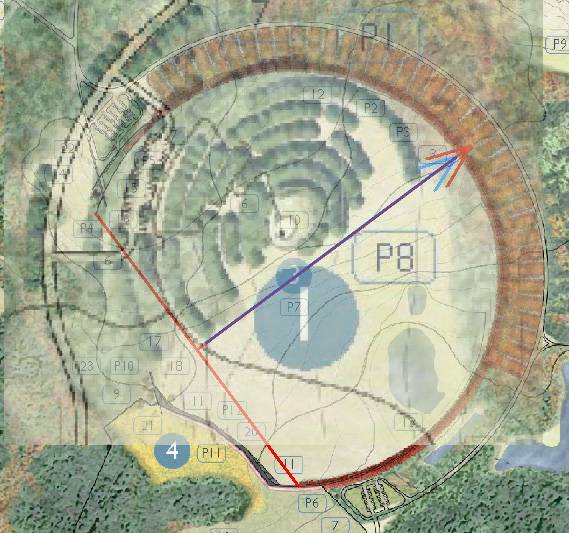 By replicating the orientation of the central crescent in the Tower of Voices, architect Paul Murdoch is confirming that neither is a coincidence. The forthcoming book Crescent of Betrayal exposes numerous such confirmations in Murdoch’s design. It is jam packed to the gills with Islamic and jihadist design elements, all of which repeat each other and point to each other, over and over and over and over again, generally to within a tenth of a degree. The mihrab is the focus of a mosque similar to the way that an altar is the focus of a Christian church. Mosque sermons are delivered from a pulpit, called a mimbar, that is usually placed either in front of the mihrab or to the side of the mihrab. Mihrabs can take on a variety of shapes. 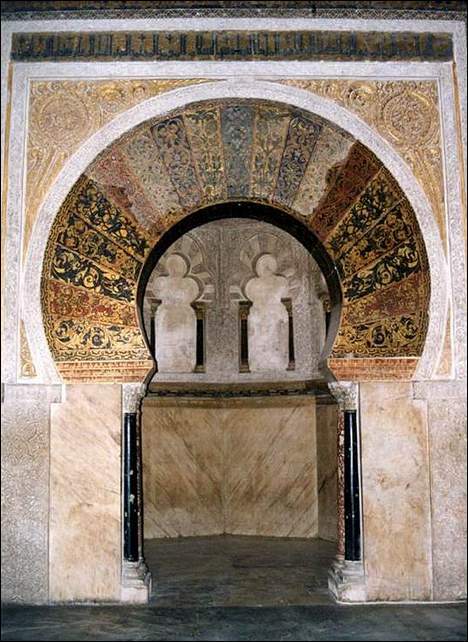 Many have a pointed arch shape, but the prototypical mihrab (as found at the Prophet’s Mosque in Medina) is crescent shaped, like the Cordoba mihrab. Mihrabs are usually three dimensional. Sometimes the depth dimension is fairly shallow (hence the common description of a mihrab as a “prayer niche”). Sometimes the depth dimension is pronounced, as in the Cordoba mihrab. But not all mihrabs are three dimensional. One prominent exception is the Muslim prayer-rug, called a “musalla” (translated “small mosque”). The prayer-rug is a mosque reduced to its bare essentials. It is a personal mihrab, giving the direction to Mecca only in the horizontal dimensions of width and depth. Geometrically, the Crescent of Embrace is equivalent to a gigantic Muslim prayer-rug. There are about a dozen typical mosque features. Crescent of Betrayal will detail how every one of these typical mosque features is realized in the Crescent of Embrace design, all on the same epic scale as Murdoch’s half-mile wide mihrab. Further, these mosque features exhaust the entire design. There is literally nothing in the entire Crescent of Embrace that is not readily interpretable as a typical mosque feature, realized on an epic scale. Included in these mosque features are a host of terrorist-memorializing features. (Most grand mosques are memorial mosques.) Not only is the Crescent of Embrace slated to be the world’s largest mosque, it is a terrorist-memorial mosque. Screenshots of Paul Murdoch's half-mile wide central crescent, both from the original Crescent of Embrace site-plans (left) and from the site-plans for the Bowl of Embrace redesign (right). Ignoring the re-coloring, about the only visible change is the additional arc of trees on the left side of the memorial. This change does not affect any of the mosque features of Murdoch’s design. In particular, it leaves Murdoch’s giant Mecca-oriented mihrab completely intact. As can be seen in the image on the left, the most obtruding upper tip of the original Crescent of Embrace was not defined by trees. Rather, it was created by the end of the thousand-foot long, forty-foot tall, Entry Portal wall. Since the upper crescent-tip was defined by the wall, not by trees, adding a few trees out beyond the end of the concrete wall does nothing to alter the presence or definition of the original upper crescent-tip. The bottom crescent tip is also unchanged in the redesign. The last red maple tree on the bottom of the Bowl of Embrace remains exactly where it was in the original Crescent of Embrace design. With its defining features unchanged, the giant mihrab is unchanged. To understand how the additional trees are irrelevant to Murdoch’s mosque design, just note that, like the Christian cross, a Muslim prayer-rug, or a mihrab, is a self-contained religious construct. It should be placed in an area that is clean and fit for prayer, but other than that, its meaning is unaffected by what may be around it. All architect Paul Murdoch did was plant some additional trees behind his giant mihrab/prayer-rug, which is no different than a Muslim placing a prayer-rug in front of some trees. The trees make no difference to the presence or meaning of the prayer-rug/mihrab at all. The only significant change in the redesign is the addition of the trees on the far left of this image. These trees are not even in the field of vision of a person facing into the crescent (towards the right side of the image). Thus they do not even affect a person’s perception of the giant Mecca oriented crescent/mihrab, never mind the mihrab’s presence or integrity. What was startling about the original design is the nakedness of its crescent and star configuration. The Bowl of Embrace redesign makes the Islamic crescent a bit less naked, but that is all it does. Murdoch’s just added a few irrelevant trees, planted to the rear of a person facing into his central crescent. In effect, he put a fake beard on. For his second pass a gate-security, he wrote “not a bomb” on his bomb, and the Memorial Project waved him through. Most Muslims calculate the direction to Mecca by the great-circle or shortest-distance method. A variety of great-circle calculators are available online. The Kansas City Amateur Television Group has one posted here. 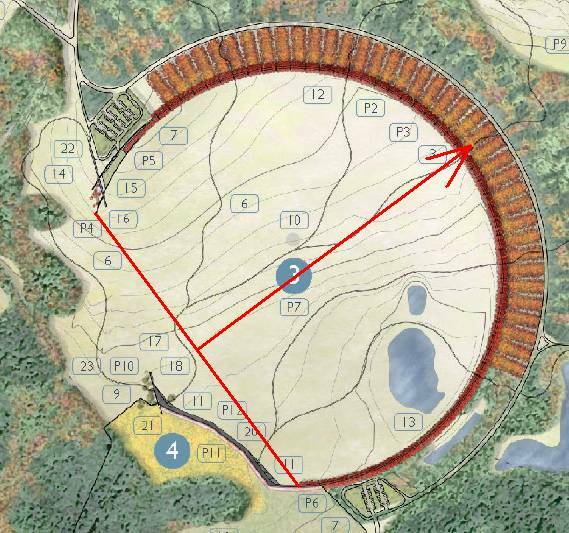 Visiting the Flight 93 crash-site with Google Earth shows the coordinates of the point of impact to be 40:03:07N by 78:54:17W. A Google Earth visit to Mecca shows coordinates of 21:25:48N by 39:49:12E. Punching these numbers into the KCATV calculator, the direction to Mecca from the crash-site comes up as 55.19 degrees (measured clockwise from north). Screen-shot of great-circle calculator. 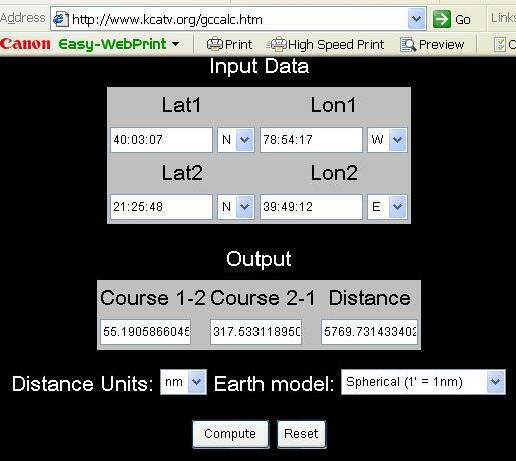 Different calculators use different assumptions about the shape of the Earth, but they all yield directions to Mecca from the crash site that are within a tenth of a degree of 55.2. To take a screenshot of a graphic on a Windows PC, press “alt” + “print screen” at the same time. A screen-shot of your top window is now on your clip-board and can be pasted into a graphics program. 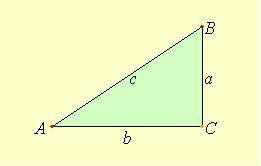 For any right triangle, the tangent function of an acute angle A is defined as the ratio of the side opposite A to the side adjacent to A. Tangent (A) = (a/b). Arctangent (tangent(A)) = arctangent (a/b). A = arctangent (a/b), which is just what we need. Microsoft paint allows us to measure a and b in pixels, and we want to know the implied angle A. To translate into degrees from north, subtract A from 90. If you copy the crescent-bisector graphic above and paste it into Microsoft Paint, you can use Paint's pixel counting tool (activates with line tool) to find that the bisector has a run of about 277 pixels and a rise of about 206 pixels. Arctangent (206/277) = 36.64. Subtract from 90 to get degrees clockwise from north of 53.3 (which is 1.83º north of the exact Mecca direction of 55.19º clockwise from north).